If you wake up on the weekend with a sweet tooth, there’s no better place than Kuppa. 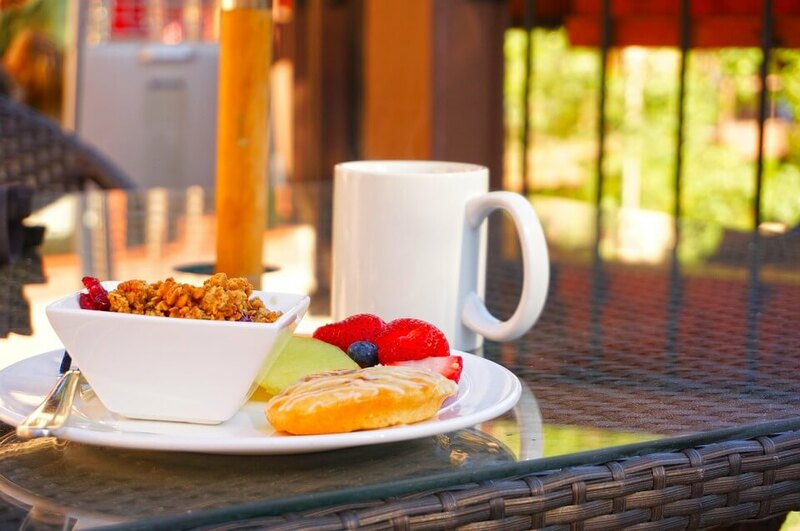 Relax for a while and enjoy their bakery selection, or try their more traditional brunch options like French toast or eggs benedict. Whatever you choose, be sure to wash it down with a cup of their fresh roasted coffee. Kuppa was the first restaurant in Bangkok to offer in-house roasted coffee, and their blends are not to be missed. Those looking for a healthy way to start their day will enjoy Brekkie’s range of fresh, healthy choices. Try their Skinny Royale, a lighter take on eggs benedict that has smoked salmon and a poached egg on rye toast, topped with Brekkie’s signature skinny sauce. While they serve breakfast all day, Brekkie also offers a variety of healthy lunch and dinner options, including salads, sandwiches, a number of quinoa dishes, and more. Their organic teas and espressos are great additions to any meal. Bangkok is known for welcoming its foreign ex-patriots, which also means that its full of restaurants with a variety of ethnic influences. If you’re an Aussie transplant looking for a taste of home or just a food-lover looking for a new adventure, Toby’s is the place to be. They serve up traditional Australian staples for breakfast, lunch, and dinner. Many of their dishes also have local influences. For a decadent start to your day, try their crispy French toast, which is incidentally on both their breakfast and dessert menu. If you haven’t enjoyed a traditional Thai breakfast yet, On Lok Yun should be at the top of your list. This restaurant has been serving up Thai-favourites for more than eighty-years now. Try local favourites like kaya bread (egg custard), or go simple with eggs and toast. A visit to On Lok Yun is also a great trip back in time, as their shelves are filled with vintage items that create an atmosphere that hasn’t changed since the establishment first opened for business. If you’re in a hurry and need a fast breakfast, or one that you can take with you, Amatissimo Caffé is the perfect stop. Their pastries range from the traditional to the unique, but all are decadent and delicious. Try a bacon cheese croissant or a Monkey Croissant, which are small pieces of croissant that are coated in brown sugar, cappuccino, or chocolate chilli. If you’re grabbing a bite to go, just be sure to grab some extra napkins! Amatissimo Caffé also offers their own unique blend of coffee to help fuel your next adventure. Located in a restored building that is over two-hundred-years-old, Farm to Table, Hideout is a unique establishment that specialises in organic, locally grown options for breakfast, lunch, and dinner. The location is as natural as the food that it serves, with customers dining in an open-air courtyard. Their recipes are a blend of European and Asian inspired dishes, there’s something for every palate. The menu changes with Thai’s different growing seasons, so be sure to check back often to see what’s cooking. If you’re looking for a trendy, modern spin on breakfast, look no further. Gastro 1/6 serves up spins on traditional breakfast favourites. Try their English breakfast, which adds Cumberland sausages, mushrooms, and garlic-spinach to the traditional eggs and baguette. This restaurant is unique in that customers order at a counter before finding a seat. Also, come back later to try their vibrant, organic lunch and dinner options. You might be surprised to learn that this popular Bangkok coffee shop actually owes its roots to Nordic influences. Their four locations around the city offer simple, quick breakfast options like yogurts, parfaits, bagels, and more. But their coffee is what draws most of their customers. With a number of artisanal brews and crafted drink options, there’s something on the menu for every caffeine (or decaf) lover. At Black Box, it’s all about getting back to the breakfast basics. Their two-eggs-any-style option, served alongside toast, sausages, grilled tomatoes, potatoes, and a salad, will have you dreaming of breakfasts from your childhood. During dinner, enjoy a mix of European and American-inspired dishes with Asian influences. Dark, modern décor and a simplified menu have made this a popular spot for the city’s hipster community. BKK Bagel Bakery is the creation of two friends, one from America and one a native of Thailand, who decided to bring the flavours of New York to the streets of Bangkok. Their bagels are hand rolled, and topped with a variety of options, from salmon, to pastrami, to tuna, and more. At BKK Bagel Bakery, it’s never too early for dessert. Follow up on breakfast with a sweet American favourite, like New York-style cheesecake, apple or pecan pie, or salted caramel brownies. If bagels aren’t your thing, try one of their other sandwiches or salad options. With a menu that’s full of truly unique options, (Not Just) Another Cup is serving up so much more than the name suggests. While you can certainly enjoy a cup of their fresh coffee or cold-pressed juices, their breakfast options are what draws a crowd. Try their Quinoa Zucchini Fritters, which come topped with avocado and a poached egg. Or, surprise your taste-buds with the Moroccan-style skillet, which has eggs cooked in a spiced tomato sauce, served with bread that’s perfect for dipping into this flavourful dish.